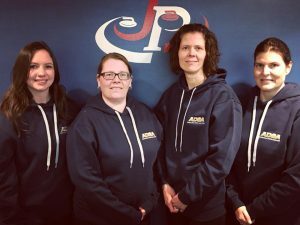 Albertans Holly Jamieson (skip), Sally Korol, Nyla Kurylowich and Andrea Scott are the members of the Canadian women’s curling team, who won the bronze medal at the 2017 World Deaf Curling Championships in Sochi, Russia. It was the third international medal for Kurylowich and Korol, and the first for Jamieson and Scott. “We were impressed by how much other countries had improved their level of game. China is getting stronger with three young curlers aged 16. We were thrilled to win the bronze after really challenging games. We played against Hungary,” said Kurylowich. 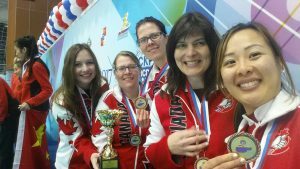 Team Jamieson will play together again at the Canada Deaf Games in Winnipeg this month, and they look forward to it as there will be good opponents. “We will finally have four women teams to play against. We are thrilled about that, because at the 2017 national trials, there was only one team from Alberta. We can’t wait to compete and meet new curlers,” said Kurylowich. Team Jamieson practices twice a week, including matches in the local league every Wednesday evening. The team is at the top of their pool A. They also took part in two bonspiels this year. Kurylowich and Korol have been playing together for over 10 years and took part in several tournaments, including the World Deaf Curling Championships and the first Canadian Deaf Curling Championship in 2009 in Winnipeg. They have been playing with Jamieson and Scott since the last five years. Team Jamieson would like to see more young women interested in playing curling and representing Canada. “We really need new young curlers. It is getting difficult to find young curlers as Canada is a big country. We need to modify our strategy to attract new curlers,” said Kurylowich. Jamieson and compagnie hope to find these young curlers at the Canada Deaf Games. Women’s curling matches will be on Feb. 21, 22, 23 and 24. Consult the schedule.